“DEAR BOB,” it said, “I remember the man well. I was with him at Calcutta, and afterwards at Hyderabad. He was a curious, solitary sort of mortal; but a gallant soldier enough, for he distinguished himself at Sobraon, and was wounded, if I remember right. He was not popular in his corps—they said he was a pitiless, cold-blooded fellow, with no geniality in him. There was a rumour, too, that he was a devil-worshipper, or something of that sort, and also that he had the evil eye, which, of course, was all nonsense. He had some strange theories, I remember, about the power of the human will and the effects of mind upon matter. I read this epistle over several times—at first with a feeling of satisfaction, and then with one of disappointment. I had come on some curious information, and yet hardly what I wanted. He was an eccentric man, a devil-worshipper, and rumoured to have the power of the evil eye. I could believe the young lady’s eyes, when endowed with that cold, grey shimmer which I had noticed in them once or twice, to be capable of any evil which human eye ever wrought; but still the superstition was an effete one. Was there not more meaning in that sentence which followed—”He had theories of the power of the human will and of the effect of mind upon matter”? I remember having once read a quaint treatise, which I had imagined to be mere charlatanism at the time, of the power of certain human minds, and of effects produced by them at a distance. We had secured one of the side boxes, and did not arrive until after the performance had begun. I had hardly taken my seat before I recognised Barrington Cowles, with his fiancee and old Mrs. Merton, sitting in the third or fourth row of the stalls. They caught sight of me at almost the same moment, and we bowed to each other. The first portion of the lecture was somewhat commonplace, the lecturer giving tricks of pure legerdemain, with one or two manifestations of mesmerism, performed upon a subject whom he had brought with him. 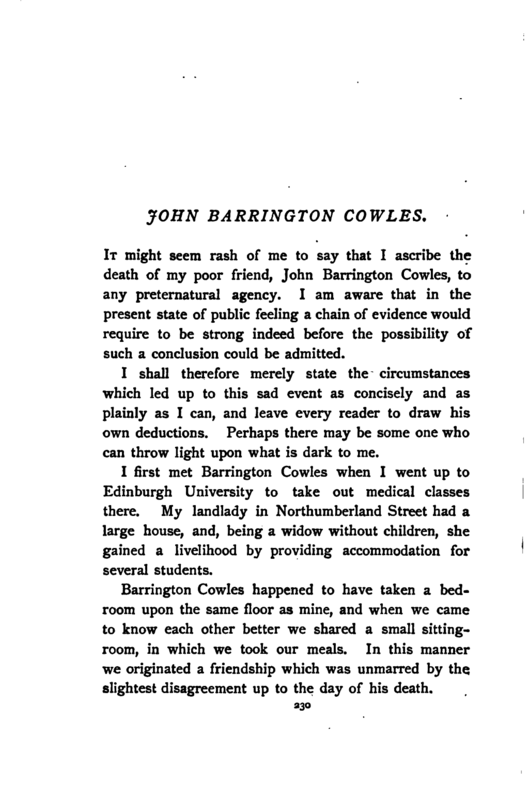 He gave us an exhibition of clairvoyance too, throwing his subject into a trance, and then demanding particulars as to the movements of absent friends, and the whereabouts of hidden objects all of which appeared to be answered satisfactorily. I had seen all this before, however. What I wanted to see now was the effect of the lecturer’s will when exerted upon some independent member of the audience. With these words the lecturer came to the front of the platform, and glanced over the first few rows of the stalls. No doubt Cowles’ dark skin and bright eyes marked him out as a man of a highly nervous temperament, for the mesmerist picked him out in a moment, and fixed his eyes upon him. I saw my friend give a start of surprise, and then settle down in his chair, as if to express his determination not to yield to the influence of the operator. Messinger was not a man whose head denoted any great brain-power, but his gaze was singularly intense and penetrating. Under the influence of it Cowles made one or two spasmodic motions of his hands, as if to grasp the sides of his seat, and then half rose, but only to sink down again, though with an evident effort. I was watching the scene with intense interest, when I happened to catch a glimpse of Miss Northcott’s face. She was sitting with her eyes fixed intently upon the mesmerist, and with such an expression of concentrated power upon her features as I have never seen on any other human countenance. Her jaw was firmly set, her lips compressed, and her face as hard as if it were a beautiful sculpture cut out of the whitest marble. Her eyebrows were drawn down, however, and from beneath them her grey eyes seemed to sparkle and gleam with a cold light. I looked at Cowles again, expecting every moment to see him rise and obey the mesmerist’s wishes, when there came from the platform a short, gasping cry as of a man utterly worn out and prostrated by a prolonged struggle. Messinger was leaning against the table, his hand to his forehead, and the perspiration pouring down his face. “I won’t go on,” he cried, addressing the audience. “There is a stronger will than mine acting against me. You must excuse me for to-night.” The man was evidently ill, and utterly unable to proceed, so the curtain was lowered, and the audience dispersed, with many comments upon the lecturer’s sudden indisposition. “Did what?” she asked sharply. “Why dangerous?” she asked, in a tone of surprise. “He never mentioned your name to me,” I answered, truthfully enough. “You will be sorry to hear that he is dying.” As I said it we passed by a lighted window, and I glanced down to see what effect my words had upon her. She was laughing—there was no doubt of it; she was laughing quietly to herself. I could see merriment in every feature of her face. I feared and mistrusted the woman from that moment more than ever. We said little more that night. When we parted she gave me a quick, warning glance, as if to remind me of what she had said about the danger of interference. Her cautions would have made little difference to me could I have seen my way to benefiting Barrington Cowles by anything which I might say. But what could I say? I might say that her former suitors had been unfortunate. I might say that I believed her to be a cruel-hearted woman. I might say that I considered her to possess wonderful, and almost preternatural powers. What impression would any of these accusations make upon an ardent lover—a man with my friend’s enthusiastic temperament? I felt that it would be useless to advance them, so I was silent. Towards the end of the winter Cowles remarked to me that he intended to marry Miss Northcott as soon as possible—probably some time in the spring. He was, as I have already remarked, fairly well off, and the young lady had some money of her own, so that there was no pecuniary reason for a long engagement. “We are going to take a little house out at Corstorphine,” he said, “and we hope to see your face at our table, Bob, as often as you can possibly come.” I thanked him, and tried to shake off my apprehensions, and persuade myself that all would yet be well.